The comprehensive Advance HD (High Demand) spray gun range ensures there’s a DeVilbiss spray gun to suit all types of industrial spray finishing applications. Pressure, Suction and Gravity feed, the DeVilbiss Advance HD family utilise a comprehensive, wide range of Compliant Air Caps to provide outstanding coatings’ atomisation for handling all types of solvent, waterborne, high solids and 2K materials. Advance HD unrivalled high performance is achieved with new design technology utilising high capacity air passages with a separate “balanced” air valve to provide an unrestricted flow of compressed air through the gun body. 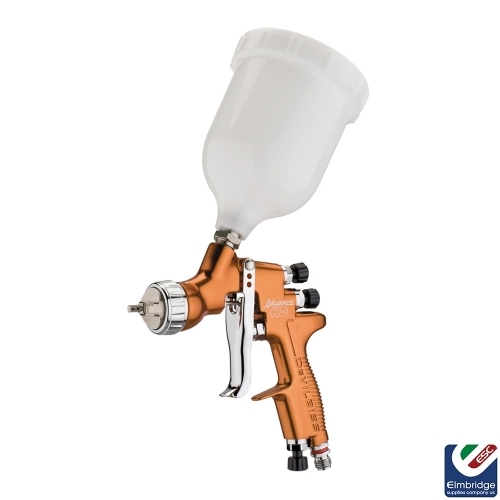 This “free breathing” air movement enables the precision-engineered air caps and fluid tips to produce superior atomisation with consistent even distribution throughout the spray pattern. DeVilbiss Advance HD is precision built using the best materials and component parts for a guaranteed, reliable, long and durable working life in all industrial markets. Light weight with a lighter trigger action and increased finger room. DeVilbiss Advance HD is perfectly balanced and naturally comfortable thanks to the fit and feel of the contoured handle design. It greatly reduces operator fatigue and significantly lessens the chances of RSI or finger problems. Comfort that pays off by increasing productivity wherever DeVilbiss Advance spray guns are used, whether it’s a small finishing operation or a high volume production line.